Enter Our Halloween Costume Photo Contest: Winner gets $30 in Free Product! We want to see your Halloween Costumes! After you upload your photograph to our Facebook contest you will be able to vote for your photograph. 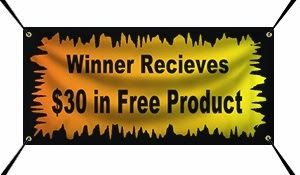 The photograph with the most points will win $30 in free product from Banners.com. The contest runs through November 8, 2013. Votes are important! Each vote it worth points, and the photograph with the most points at the end of the contest wins the $30 in free product.